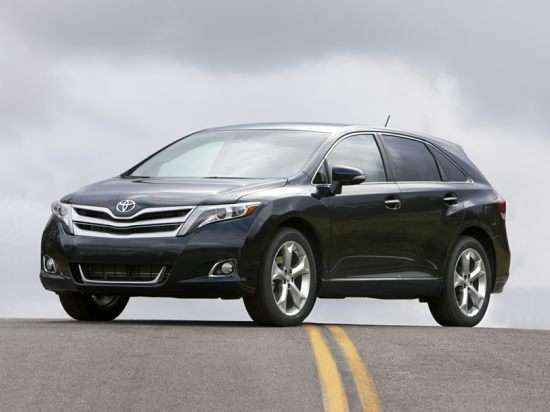 After several big updates for the 2013 model year, the 2014 Toyota Venza sees little change. The Venza XLE gains standard power folding exterior mirrors this year, while the Venza Limited is equipped with standard front and rear parking sensors. Toyota sells the 2014 Venza in LE, XLE, and Limited trim levels. Upgrading to XLE trim adds leather seats and interior trim, a navigation system, a reversing camera, Entune App Suite technology, and an upgraded audio system with HD Radio, iTunes tagging, and Bluetooth music streaming. Additionally, the Venza XLE has heated front seats, memory for the driver’s settings, a Smart Key passive entry system with push-button starting, a power rear liftgate, and power folding side mirrors with a reverse tilt-down feature. Choose the Venza Limited for a standard V-6 engine, LED running lights, HID headlights with automatic high-beam setting, front and rear parking sensors, and 20-inch aluminum wheels. This model also comes with a standard panoramic glass roof, a JBL premium audio system, a hard-drive navigation system, and expanded Entune App Suite features. A 181-horsepower, 2.7-liter 4-cylinder engine is standard equipment for the 2014 Venza LE and XLE, and a 268-horsepower, 3.5-liter V-6 is optional for the XLE model and comes standard for the Venza Limited. Both engines deliver power to the front wheels through a 6-speed automatic transmission, and all-wheel drive is optional. Toyota also includes free scheduled maintenance for the first two years or 25,000 miles of ownership. Regardless of engine choice or whether you select the optional AWD system, the 2014 Venza delivers between 21 mpg and 23 mpg in combined driving. According to the National Highway Traffic Safety Administration (NHTSA), the 2014 Venza receives a 5-star overall crash-test rating. In tests conducted by the Insurance Institute for Highway Safety (IIHS), the Venza earns the best rating of “Good” in the four tests to which it has been subjected. Among the available features offered for the 2014 Venza, the crossover can be equipped with a Display Audio system with Bluetooth music streaming, HD Radio, iTunes tagging, and Entune App Suite technology. A reversing camera is also available, along with a power tailgate, a navigation system, and a Smart Key passive entry system with push-button starting.